The Celtic Arts Festival is an afternoon of not just music, but dance and culture too. And few things are as elemental to culture as food. Behold, The Pure Pasty! 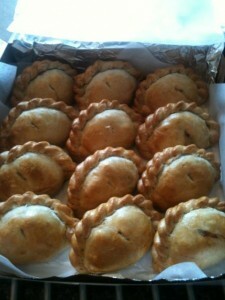 delicious pasties with savory fillings - all sorts! We asked Mike “The Pasty” Burgess to tell us more about himself, his company, and pasties. He obliged, just has he has when some of us have gone in to ask for that one last pasty. Q: Five fun things you’d like to share about Pure Pasty? Fun Thing 1, having fun working in Pure Pasty is really important. All our staff are happy and willing to joke with everybody. Attitude is everything and it has to be a good attitude. Fun Thing 2, although tasting new dishes is vital testing, we really enjoy that process. Fun Thing 3, it’s soooo hard not to eat chocolate and pasties all day. Fun Thing 4, all the team are so passionate about food, they bring in all kinds of items they made at home as treats for their colleagues. Fun Thing 5, Our customers are the best. Seriously. I have never met a nicer, well-mannered crowd, I really look forward to serving them every day. As people know I like to chat. Q: Tell us something fun we don’t know about you. I have wanted to do this for so long, it’s like a dream come true. My original plan was to open in Colorado so I could snowboard every day in winter, little did I know how precious spare time would be. I have never had a restaurant before, I was an IT manager for HSBC. Q: What does St. Patrick’s day mean to you? Beef and Guinness pies. I love them. I sometimes don’t want to sell them so there will be more for me. Q: How many pasties a day? How many do I eat? Too many. How many do we make? It averages out about at over 1000 per week. Q: PASS-ty, not PAY-sty. How many times a day do you have to tell people the difference? I only tell people if they ask me, how it’s pronounced. I feel it’s rude to tell people uninvited. We are always having fun with British versus American pronunciations, plus words and phrases. Q: What music do you and your staff listen to while you roll out (is that the right term?) all those pasties? Do you sing?! We have a huge range of music tastes. It’s more of who can get their iPod on the docking station. Mines more cool Britannia, Oasis, Coldplay, Snowpatrol. But we fly off with jazz, and big band sounds too. Liz is obsessed with U2. Nicola starts dancing to anything from ABBA. Sometimes I get tempted to sing along, but that is usually drowned out by the complaints from the kitchen, and apparently it attracts stray cats.